Executive suites or what is now coworking space, can be seen to have really taken off when Regus came along in 1989 . They’ve worked well both for traveling business people who either aren’t staying in a place with a business center and for small businesses, especially professionals, who want maximum flexibility which comes with short term leases and low rent. They’re also seen as very “corporate” which works well with some businesses , but less well with creative types. Enter coworking spaces which started in the West Coast, in Silicon Valley (called “incubators”), and are now spreading and really coming into their own. The West Coast was also a breeding ground for a new kind of office – office as campus which lends itself to social interaction, such as ones from Facebook, Google and Microsoft. On the private front, the sequel to Regus were incubator type formats with not only private offices, but dedicated desks for rent, and for even less money, a flexible desk which is a space at a long communal table. The ground floor has what Rockwell calls “Spanish Steps”, plywood stairs with kilim pillows that serves as a meeting and work area during the day and at night is the setting for lectures and presentations. Recent cultural events include a lecture by designer Paul Smith and a conversation between a string theorist and a steel drum player. NeueHouse also has access for members to resources like a 1Gbps internet connection, video editing suite and 60 seat screening room. Sounds to me like a model for expansion. And for those in the hotel industry, this might be a new offering for a hotel loyalty program with a membership based business center? What do you think? The latest luxury real estate trend: high end condo developers have found the perfect new amenity — art, and they’re using it to generate buzz, separate themselves from the competition, and for community relations, according to a recent article in the Wall Street Journal. New York and Miami developers are leading the pack in this innovation.One of the more creative uses of art is to make friends in the neighborhood before the building’s opening by holding a monthly tour of area galleries. For instance, the lobby turns into an art gallery every six weeks at 350 Bleecker in New York’s West Village, complete with an opening party for 50 to 75 people and actual sales of the art. An invite to a potential client becomes a social event and time for bonding. Probably the boldest initiative is from Argentine hotel and real estate developer Alan Faena (hotels in Buenos Aires and Rio de Janeiro) who is building a $100 million exhibition space called Faena Arts Center by starchitect Rem Koolhaas that will make the development (pictured here), which includes a hotel, a cultural destination. It will feature art exhibits and dinners with visiting artists. The Faena Group also sponsors an annual art award with $75,000 in prize money ,and commissions original work as well. 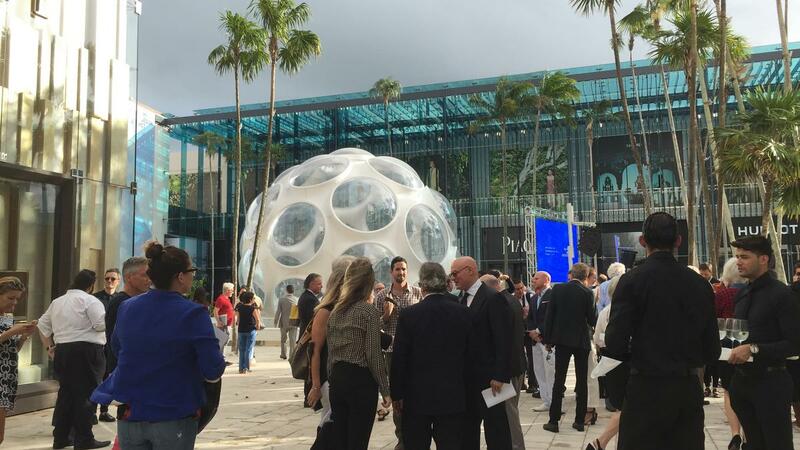 Also in Miami, the new Oceana Bal Harbour has commissioned $14 million in art from mega artist Jeff Koons. After five years, the art can be sold upon an 80% majority vote of homeowners. Similarly, at the Ritz Carlton Residences in Chicago, buyers of apartments selling for $1 to $11 million will get a share of a half million dollar art collection. They can choose to change it or sell it and split the proceeds. It will be fascinating to see how this plays out as, though it’s a noble effort, if you’re ever been on a condo board you know how contentious even the smallest thing can be. Luxury auto companies look to profit from their high profile brands, branching out into hotels and condominiums. Urban roofscapes continue to be hot real estate and there’s a lot happening in the city skies. First it was rooftop pools and bars (NYC’s Gansevoort, Madrid’s Urban), then rooftop beehives (Fortnum & Mason, Fairmont Royal York) and rooftop pop-up hotels (Hotel Everland at Paris’ Palais de Tokyo museum). So how is the the restaurant industry getting on board?